New Doritos Flaming Flavours, the signature bold flavour and intense crunch you’ve grown to expect from Doritos with a spicy- international twist! 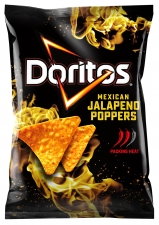 The two new flavours joining the existing bold Doritos range is Southern Sticky Chicken and Mexican Jalapeno Poppers. The new range will be supported through a variety of media across digital and social as well as impactful in-store point of sale. Products are available now from Coles and Independents in 150g and will launch in Woolworths in February, as well as 80g in petrol and convenience channel. RRP $3.29.